Wednesday is no longer just Wednesday in our house, it's Orange Wednesday which means two tickets for the price of one at our local cinema. Without this deal you wouldn't get much change from a £20 note for two tickets which seems like an awful lot of money for a couple of hours at the flix. So tonight we're joining our local movie lovin' tin foil rustlin' bring your own sarnie brigade to watch Slumdog Millionaire which is currently scoring a huge 94% on the Rotten Tomato Tomatometer (they're usually pretty spot on). Basic plot of the film: The story of the life of an impoverished Indian teen Jamal Malik, who becomes a contestant on the Hindi version of "Who Wants to be A Millionaire?" It's directed by Danny Boyle (Trainspotting, 28 Days Later) and has already won four Golden Globes for best director, picture, screenplay and score (A.R. Rahman) and has had another 26 wins & 23 nominations (see here)-wow! I've already been and got our tickets and will let you know what I thought of it (without spoilers). btw, have you ever won any money? 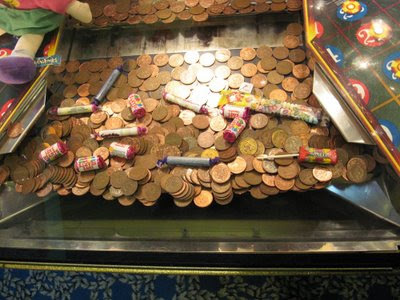 I like playing the two penny machines (see photo) on Brighton Pier (last of the big spenders!) but I always end up putting my two pence winnings back into the machine and then coming away with nothing. Then some hardered professional two penny machine watcher lurking in the background (I swear they exist!) spots you running out of money and has been watching you fill up the machine, moves in, puts a couple more two pence pieces in and bam, a whole pounds worth of them drop. You know the kind of people I mean. I never learn. This looks like a great movie, I want to see it!